This isn’t going to be a “here’s my bag and why I like it” post or telling you what I think is the best bag. Like most people carrying camera gear, I’ve been through quite a few bags and backpacks over the years. Just ask my wife… It was as if the next bag in a magazine would be better than the one currently in use. However, one lesson learned about finding the perfect camera bag is that there isn’t one. While the latest bags always promise to be the last bag you’ll ever need, there’s always compromises; after the novelty wears off you’ll realize what you’ve settled for. The best thing I’ve learned about camera bags, and coming from someone who has had back surgery, DON’T ORDER WITHOUT TRYING. That was my mistake for years, I would see advertising for a bag or spot one online and order it. Why? In my mind this was the last bag purchase so it was money well spent, right? I had used a lot of bags, but mostly Lowepro and Kata bags stand out from 2008-2015, they’re both great companies with excellent bags. However, after using each new purchase for some months, there would be things I didn’t like, things I wanted from earlier bags, or worst of all, they just hurt after a while. Then I’d spot another bag, and the cycle continued with the exception of three years. First, does this have features that my current bag doesn’t? This has to be a substantial upgrade, a game changer, to ditch the current setup that I know works. If this is a yes, move on to the next question. Second, can the current bag be modified to do what the perspective bag does? So far, in most cases the answer has been yes, done! It’s usually by reorganizing, which I hate doing because it’s nice knowing where everything is when in the dark. However, when the answer has been no, back to Question 1, just how substantial is this again? So far, it’s never been worth ditching the current system that works. Third, can a try it somewhere first? To this date, I haven’t gotten to this question. If Questions 1 and 2 lead to number 3 and there’s no place to try out the bag, I’m not buying it, period. Again, I’m never buying another bag without putting everything in it and trying it! I’ve come to believe that most of the features that new bags offer tend to be the ability to conveniently pack more gear. There’s nothing wrong with that, some people need this and more. For this guy, more weight in the bag equates to back pain. Another thing that’s worked to curb buying bags, and while this might seem a bit extreme, is removing labels. While this was originally for anti-theft purposes, a savvy thief could understand that high-end camera bag labels likely protect high end camera gear. However, this has also makes it a little more difficult selling a bag online. People want to know it’s an original when they buy it, good luck selling them now, with no label right? I’ve cut up a military style gear tag, in orange like the one at the right, and placed it over the main label with epoxy. It’s not coming off anytime soon… Not only does it cover the label, it makes the bag stick out slightly so it would be very easy to spot if someone grabbed it in a crowd (photo at the top). Again, it’s worked for me. So that’s the advice, I’ve had three bags that have worked perfectly for over a year and have been carried extensively, that’s not changing anytime soon. The brand of my bags doesn’t matter, they work for me, you might not like them and that’s life. 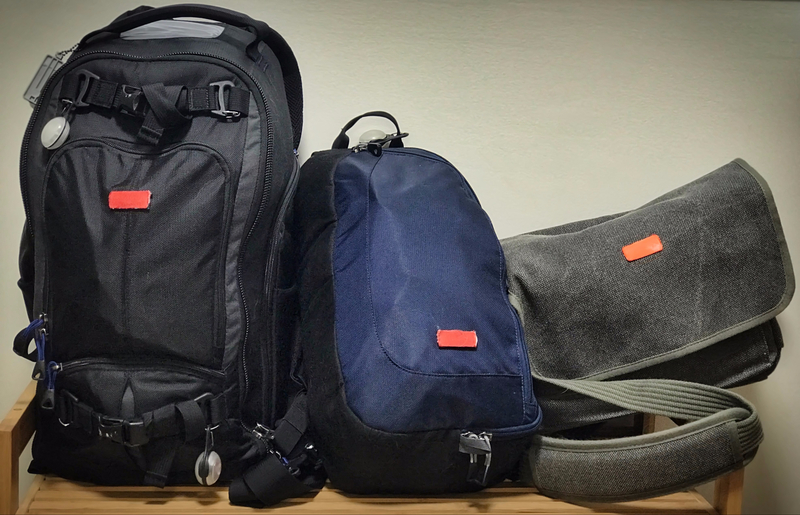 There are so many quality camera bags and backpacks to choose from, but it really does require trying them out to find one that’s right for you. Remember, there is no perfect bag, you will have make concessions in some way. Just get one that does most of what you need and you’ll be happy.